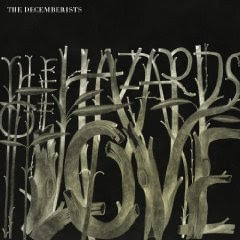 The Decemberists - "The Hazards of Love" - The fifth album by the Portland indie rockers is a 17-track, British folk and prog rock inspired collection that "tells the tale of a woman named Margaret who is ravaged by a shape-shifting animal; her lover, William; a forest queen; and a cold-blooded, lascivious rake, who recounts with spine-tingling ease how he came 'to be living so easy and free.'" Pete Doherty - "Grace/Wastelands" - Long-famous for being the front man of The Libertines and Babyshambles and for his heavily-publicized drug use, Doherty delivers his debut solo album with contributions from Blur guitarist Graham Coxon, Dot Allison and more. Radiohead - "Pablo Honey," "The Bends" and "OK Computer" collector's editions - The band's classic first three albums are re-released in the form of 2-disc sets, with one disc containing the original albums and the second disc containing demos, live recordings and other rarities. All three are also available as "special collector's editions," which add DVDs of promo videos and live performances into the mix. Check out detailed reviews here. Pearl Jam - "Ten": Legacy Edition -If the Radiohead releases aren't enough to satisfy your 90s nostalgia, check out the new reissue of Pearl Jam's debut album, "Ten," originally released in 1991. The 2-disc set offers a unique take on the concept of the reissue in that it not only includes the original album remastered, but also a remixed version of the album by Brendan O'Brien, who produced the albums that followed. "Deluxe" and "Super Deluxe" editions add in a DVD, vinyl LP and more. See here for a more detailed review and more information on what's included in each of the editions. I Fight Dragons - "Cool is Just a Number" EP - What do you get when you mix vintage NES video game sounds with Fountains of Wayne-esque power pop? This band. You can currently download their debut EP for free by signing up for their mailing list here. Catch them live this Friday, March 27 at Martyrs'. Vacations - "I Was Bikini" 7" - An offshoot of Chicago band Chin Up Chin Up, Vacations is a trio that just released a 7" single called "I Was Bikini." The vinyl comes with a 5-song download and is available via Flameshovel Records. Jonny Rumble - "Courtney's Basement"/"To Foolishness" single (free download) - As the band works on an EP set for release in the Fall, they're offering two finished tracks, "Courtney's Basement" and "To Foolishness," for free download here. The very catchy "Courtney's Basement" represents a shift to a more melodic, slightly less punk-driven sound, while maintaining a raucous edge. Comasoft - "The Beautiful Departure" - The new CD from this local electro-rock act comes out March 28. Check out the CD release show Saturday at Subterranean.